Secondary schools run by faith groups are better than non-religious schools at building community relations, research in England suggests. A study funded by the Church of England found faith schools were rated higher than others by Ofsted inspectors on what is called "community cohesion". The church says its schools take all faiths seriously and look for common ground while respecting difference. Campaigners say the Ofsted checks do not go far enough. The research, carried out by Professor David Jesson of York University, involved the analysis of Ofsted reports on 400 secondary schools and 700 primary schools. He examined how schools were rated by inspectors on their new legal duty to "promote community cohesion", which came was introduced in September 2007. Prof Jesson says at primary level, faith schools were rated the same as non-religious schools. But among the secondary schools surveyed, faith schools were rated higher. Of the 74 secondary faith schools surveyed, 24 (32%) were rated "outstanding" at community relations. Of the 337 non-faith secondaries analysed - 55 (16%) were given the same grade. In his report, Prof Jesson said there was "clear evidence that faith schools were awarded substantially higher inspection gradings for promoting community cohesion than Community schools". "This finding... runs completely counter to those who have argued that, because faith schools have a distinctive culture reflecting their faith orientation and are responsible for their admissions, they are 'divisive' and so contribute to greater segregation amongst their communities. "This is clearly not supported by this most recent Ofsted inspection evidence." Church leaders have been stung in the past by claims that faith schools divide communities and increase segregation. The Reverend Janina Ainsworth, chief education officer for the Church of England, says schools with a religious foundation have a particular role "in modelling how faith and belief can be explored and expressed in ways that bring communities together, rather than driving them apart". "In Church of England schools that means taking all faith seriously and placing a high premium on dialogue, seeking the common ground as well as understanding and respecting difference." Some campaigners say criteria used by Ofsted to rate schools on community cohesion does not go far enough. The Accord Coalition, which campaigns for "inclusive faith schools" and for a change in the law on such schools, says inspectors should consider admissions policies and the religious education curriculum of faith schools. Its chairman Rabbi Dr Jonathan Romain said: "Building community cohesion is vitally important and we congratulate all those schools that have been working hard to meet the duty," he said. The society objects in principle to public funds being used for proselytising (preaching), he says. Three years ago religious groups in England joined forces and thwarted government attempts to force them to have quotas of children of other faiths (and none) in their schools. However, a voluntary agreement was reached that in new faith schools, 25% of places would be reserved in this way. 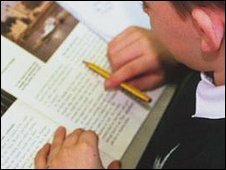 Faith schools, when they are oversubscribed, can use religion when allocating places along with other factors such as distance, aptitude or whether siblings already attend. About a third of state schools in England are faith schools - a majority of these being Church of England and Catholic, with a smaller number serving Jewish, Hindu, Sikh and Muslim communities. About 14% of Scotland's state schools are faith schools - almost all are Catholic. A spokesman for the Department for Children Schools and Families said: "We know that many faith schools have been working very hard to promote community cohesion through programmes such as 'Faith in the System' which encourages schools from different faith groups to work closely together. "We applaud the efforts that have been made in this area."